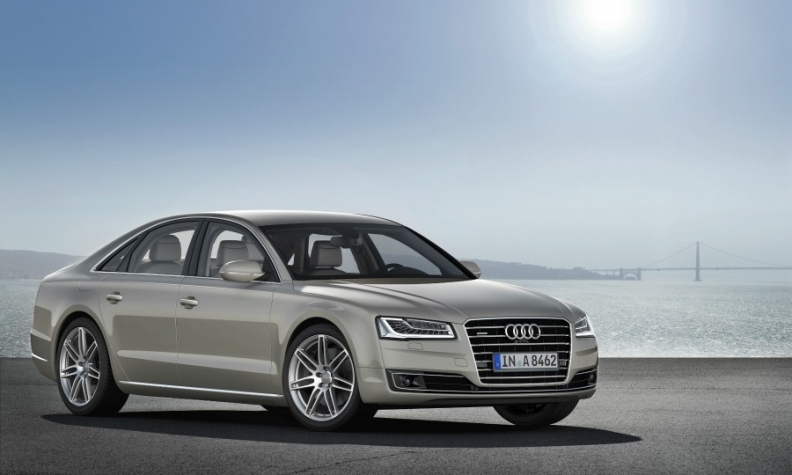 Audi said the recall affects A8 models made between 2013 and 2017. FRANKFURT -- Audi said Germany's transport watchdog is looking at whether it manipulated NOx emissions in its flagship A8 sedan. The Volkswagen Group luxury brand said it will recall 4,997 A8 models in Europe fitted with V-8 4.2-liter diesel engines to update software after it found they emitted too much nitrogen oxide. The automaker said it had reported the matter to Germany's KBA motor authority. An Audi spokesman said the KBA was pointing to an illegal manipulation of emissions. Audi said the affected cars were built between September 2013 and August 2017. The automaker said the software would likely be available in the first quarter of 2018. "Among other things, the update should ensure that after cold starts the engine more quickly reaches optimal operating conditions for the exhaust-gas treatment system so that its emissions are improved in real driving conditions," Audi said. "During the testing, it will be ensured that the new software has no disadvantages for customers in terms of fuel consumption or performance." The group said 3,660 of the affected cars were in Germany. Volkswagen was found in 2015 to have illegally manipulated engine software so that vehicles would meet NOx emissions standards in laboratory testing but not in real-world conditions, where they could emit up to 40 times the permitted levels. Several Audi models were affected and Audi has been accused in media reports of having devised the so-called defeat devices years earlier but not to have installed them in its vehicles at that time. Audi and Volkswagen have never commented on the matter. Audi has been checking all its diesel engines for illegal manipulation during the past 12 months. In July, it said it was recalling up to 850,000 diesel cars with six- and eight-cylinder engines to update software. The service was also being offered to Porsche and VW brand cars using the same Euro 5 and Euro 6 diesel engines.